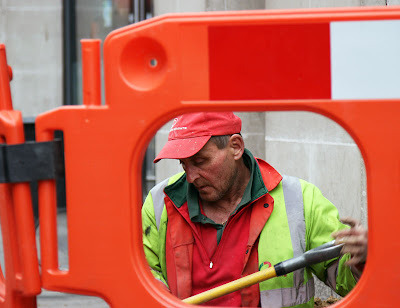 Nice framing of this man at work. ...but it will look even greater once those works are finished... I wasn't disturbed by those "incidents" when I was in London last week. Do you know why? I'm used to coping with the urban decay, the chaotic traffic jams or the never- ending/ended works in Rome and other Italian big cities. Be patient and you'll live in an even more wonderful place in ...some time...not so long, anyway, I bet. great composition - he's very absorbed. I've decided to make Wednesdays "working Wednesday" so I'' be posting a similar picture later today. Good framing of a hardworking man. Here in Chennai the roads are dug up and relaid, then the telephone or electricity department digs them up again, sometimes there are court cases. The roads remain dug up for months. It is an excellent framing of the image and his colours echo the image overall. Clever.